Another Long Walk: Amanda Goes Backpacking! I weigh my fancy new pack. Last week, I took Amanda backpacking. 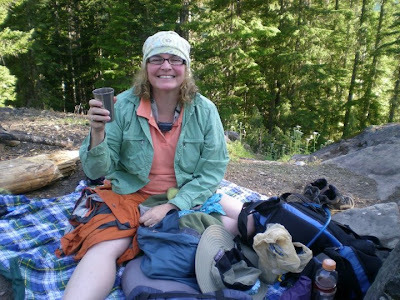 She's pestered me for years to take her backpacking, but she sets high expectations. She wants a flat trail. And beautiful scenery. And "not too far." Then she scoffs when I suggest the Alki Beach Trail. Sheesh! Amanda's not a big fan of driving on dirt roads, so I think she was happily surprised to learn that the trailhead only required a mile or so of unpaved roads to reach. Even the unpaved portion was very well graded without any washboards to make the ride unpleasant. A few cars were already parked at the trailhead, and I hoped most of them were just day hikers or fisherman so we'd have Pete Lake to ourselves during the night. On weekends, that place is a certifiable zoo with the parking lot overflowing with cars. On weekdays--not so bad. Amanda wanted to bring a tent, something I felt wasn't necessary, but since I had already loaded my pack up with close to a week's worth of food and carried a heavy bear canister, she was tasked with carrying the "lightweight" backpacking tent. (The terms "lightweight" and "backpacking tent" should never go in the same sentence together.) I strapped it to the back of her pack--my old pack that I used to thru-hike the Florida Trail, and we tried our packs out on a handy little scale Amanda bought as a birthday or Christmas present (I don't really remember which) for me a couple of years before. It's actually meant to weigh one's bag for flying purposes, as the packaging claimed, but I used it to weigh my packs and know how much weight I carried. Amanda is not enjoying the weight on her back! My pack came out to 42 pounds--on the high side of things, but most of the time, I wasn't carrying a 3-pound bear canister, a week of food, and four liters of water. The amount of water I carried really was ridiculous--this trail had plenty of water for the grabbing along the way. I just didn't want to stop and refill the water. I took the bear canister since I intended to leave my food unattended all day long as I did trail work and didn't want squirrels and other critters getting into my food. If it kept out bears as well, that's good to, but frankly, I worried more about smaller animals. Seeing a bear is pretty unusual in the wilderness. Amanda's pack weighed in at a hefty 30 pounds--the maximum weight that the pack was designed to hold. The tent made up a significant portion of the weight, but she was determined to bring it along in case the bugs were bad--not an unrealistic expectation. I filled out the paperwork at the self-permit station as Amanda headed down the trail. "I'll catch up," I told her. I did catch up, perhaps a hundred feet down the trail, which Amanda was bitterly complaining about the weight of her pack. I felt bad, but my pack was already filled to capacity and I wasn't sure what I could do to help. So she plodded along slowly, which was okay by me. We weren't in any rush. By my estimate, we had over seven hours until dark to cover just four miles. Amanda could certainly take as much time as she needed. After a good half hour or so and several rests, she loosened the shoulder straps and immediately felt better. Just by looking at her, I didn't realize she had tightened her shoulder straps so much, but once she figured out that they shouldn't be so tight, she practically zoomed down the trail. Not skipping, perhaps, but the number of rest stops decreased dramatically and her top hiking speed doubled. Wow--what a difference! I think she started having more fun at this point. Late in the afternoon, we finally arrived at the scenic Pete Lake with beautiful, snow-covered mountains as a backdrop. In the late afternoon, those snow-covered mountains are kind of washed out. The light really isn't ideal and it's definitely a much better view early in the morning. We were also a little disheartened to discover a camp of 20 or so Boy Scouts already set up there. I was a little angry at them since I knew the maximum group size in this area was 12 and the Boy Scouts clearly and deliberately violated that rule. Aren't they supposed to be teaching kids to respect the wilderness and follow the rules? I scouted up the trail a bit further looking for a campsite away from the scouts and found a nice one overlooking the lake. I went back and retrieved Amanda and we set up camp. figured out her shoulder straps were too tight. This did not go over well with Amanda. No, not at all. She lugged that tent miles into the backcountry, and by golly, she didn't want her efforts to be in vain. But clearly, there was nothing we could do to fix the problem at this point. The tent was a bust. "But you can become one with nature!" I assured her. "You won't feel claustrophobic in a tiny little tent!" It didn't really help matters, though. In fact, it might have annoyed her even further. Amanda also started a small campfire in a nearby fire right which she seemed to enjoy. Amanda has a real knack for starting campfires. I can't seem to get them started even when I have a large bottle of denatured alcohol and dry wood at my disposal, but Amanda's the MacGuyver of starting camp fires. Which is kind of ironic since she's more than little nervous handling lighters, afraid she'll burn herself with them. I worked on dinner, and Amanda said that she enjoyed watching me in my "natural element." I imagined the narrator from a wildlife documentary describing my actions in a whisper: "Now the hiker is cooking dinner with an ingenious little soda can stove. It appears that he's pouring what they call denatured alcohol into the stove, but he appears to be having some trouble with his lighter. Wait! There it goes! He got it going!" Bugs did bother us all evening, but I didn't consider them to be especially bad. I've suffered through much worse, but to listen to Amanda, you'd think we'd been attacked by biblical plagues the likes the world has never seen. Shortly after sunset, the bugs finally went away for the night and we slept in peace. Without the week of food weighing down my pack, I took the tent for Amanda and bounded down the trail without her. 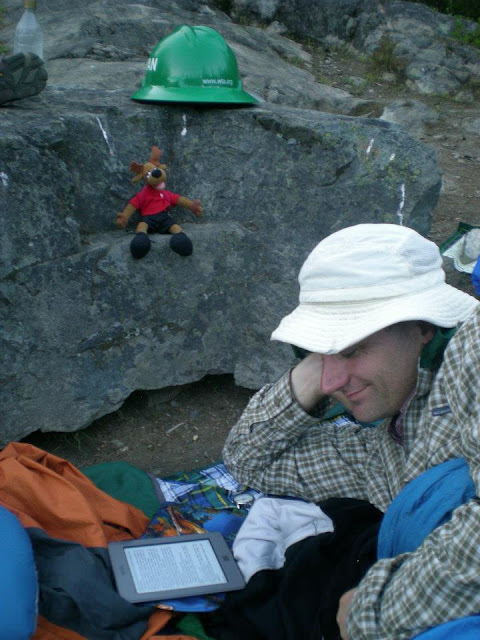 Even with the tent, my pack was considerably lighter than on the trip out. I hustled to the trailhead where a couple of WTA members had already arrived. Amanda made it back out 40 minutes after I did but before we had started the hike back to Pete Lake. Amanda drove off, having to fly to work later that evening. And I hiked back up the trail after adding a small Corona saw and a grub hoe to my gear. Amanda turned her head when you bought the Kindle..she's a true bookie. I was going to give her one but I thought she would sell it on eBay! Great to see you both out on the trail together. WINE makes everything easier!